Mango season is in full swing, and I can’t seem to resist buying a case of mangoes. This usually means we have about a dozen mangoes in the house, and ultimately means mango sauce time. I seem to buy a mango called R2E2 Mango, which can weigh up to 1 kilo (2 pounds each)! R2E2 simply means Row 2 Experiment 2, from the governments mango research facility in Bowen, Queensland. R2E2 is the 3rd most popular mango sold in Australia, and is sought after for export markets. I love the giant size and the great flavour this mango gives, and it’s non-fibrous or stringy like some varieties. R2E2 is NOT genetically modified, just has a funny name! This mango sauce recipe is inspired by an amazing mango chili sauce we used to buy in Canada. I think it was Indian in origin, but I can’t find it in Australia. My version is almost a hybrid sauce between mangoes and a sweet chili sauce. The passionfruit juice is completely optional. I have passionfruits growing in my yard, so it’s easy to source for me. I like to think that they add a really subtle tropical-ness to the sauce, but don’t sweat it if you don’t have any! Just make sure there is no passionfruit seeds, as this will ruin the recipe. The mangoes I used weigh about 500 grams (1 lb) each, so if you are using smaller mangoes, you might need to use extra. If you want to keep the sauce looking more ‘yellow’ instead of orange, simply replace the red Thai chilis (Bird’s Eye chilis) with spicy yellow chilis, like the Siam chili, and it will keep the sauce color more similar to a mango. If you use Habanero Chili Peppers, remember they are about twice as hot as the Thai Chili Peppers. Adjust recipe accordingly. You can also use frozen mangoes if fresh aren’t available. Check the ripeness and sweetness of the mango, as green mangoes will need extra sugar in the mango sauce. I love making dipping sauces like Sweet Chili Sauce or Easy Sriracha Mayo. This Sweet Mango Chilli Sauce recipe is awesome as a dip for chicken strips, shrimp, Vietnamese or Thai rolls, add to a stir fry or a salad dressing. Bon Appetit! Приятного аппетита! 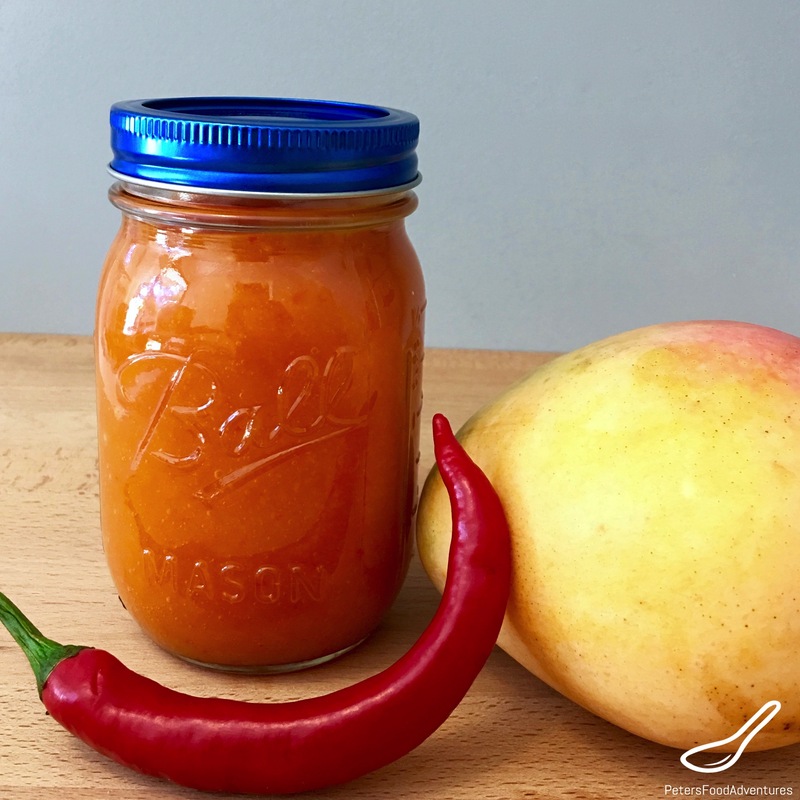 A sweet Mango Chili Sauce recipe is awesome as a dip for chicken strips, shrimp, Vietnamese or Thai rolls, add to a stir fry or a salad dressing. I love this mango sauce! Chop and deseed the chillis. You can decide on the amount of heat you want in your sauce by the amount of seeds you leave. In a saucepan, place all the ingredients, except the cornstarch, and bring to a boil over medium high heat. Simmer for 20 minutes. Remove from heat. Using a stick blender, carefully blend the mango sauce until smooth and all lumps and chillis are blended. Remember it's very hot! Don't burn yourself! OPTIONAL - only if sauce is very runny. Return to heat and return to simmer. Take 1 tablespoon of cornstarch and mix with 2 tablespoons of cold water makeing a slurry. Add the corn starch slurry to the mango sauce and cook for a few minutes until it thickens. Place into a clean sterilised jar, allow to cool and keep refrigerated. *Burning disclaimer- vinegar mango mixture is very hot, do not burn yourself. Wow the pics look amazing..m sure it tastes awesome too..???????? Yum!! I love Mango mixed with spicy. It is the perfect combo of sweet and spicy- this looks delish!! Very healthy sauce! Thanks for sharing! This looks really good, I’ve tried making a mango chutney before, but I like the idea of adding a little bit of heat to the sauce. What amazing mango access you have! It sounds like a Star Wars android! Haha! I’ve never heard it described that way before! But you are right, it does sound like a Star Wars Mango! Thanks so much for your comment, this made me laugh! 🙂 Have a great day! Lovely recipe. Any idea if this sauce can be canned and stored for a few months? Would love to give these out as gifts to family members, but mango season is about to get over in another week or so. Thanks Indu! I love mango season!! I haven’t canned this before, and am no expert, however fruit has a low ph, plus with the added acidic lime juice, I think it should be safe to can, using the water method. Always check the latest canning guidelines. We usually eat this very quickly at my house and I don’t bother canning it! Maybe I should attempt next mango season! Please let me know how it works for you! Can this be canned? If so how long in a water bath? Hi Jennifer, Yes this is fine to can in water bath, just don’t skip the lime juice. The length of time in a water bath depends on your physical elevation from sea level. If you are from 1000ft to 3000ft high, then about 20-25 minutes should be fine. I wouldn’t go less than 20 minutes, and not more than 30. Ensure to follow proper sterilization techniques, as I am sure you are aware of! 🙂 Good luck and enjoy! I never know that i can dp it with mangoes! Great! Definitely one of my favourite sauces!!! Hi Alfie, great question. I suppose some of that will be determined by the size of the mangoes. I had giant mangoes, and after it was all said and done, I had around 4 cups of sauce. Definitely going to try your mango chilli sauce, funny you should mention not being able to find a good sauce in Australia, because we have been looking for a recipe after not finding anything in the UK to compare with ‘The Frosty Mango’ mango chilli sauce, from Queensland. If your not familiar with it, you should give it a try The Frosty Mango is a mango farm about about 40km north of Townsville. Every time we visit our daughter in Townsville we drive up and buy a few bottles to bring home.